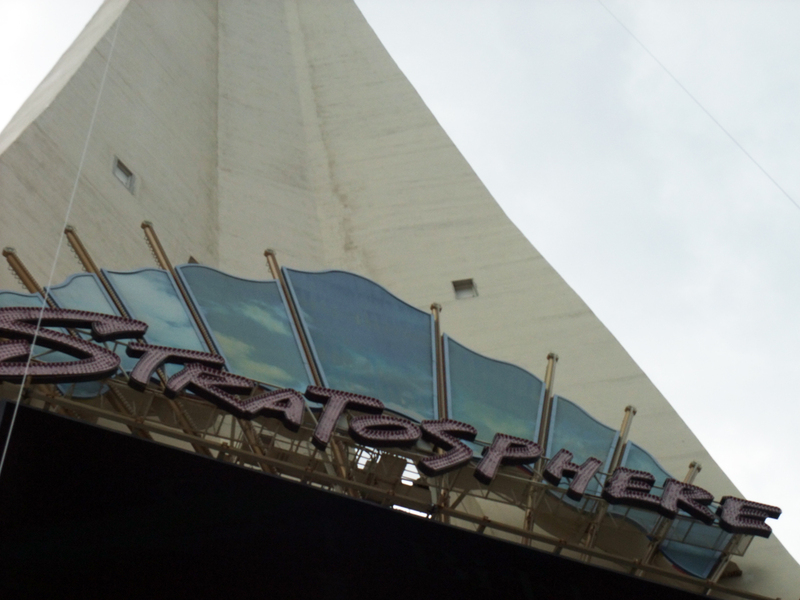 Our quest for thrills takes us this time to Las Vegas, where the Stratosphere Hotel and Casino boasts one of the most unique thrill experiences ever–the SkyJump. 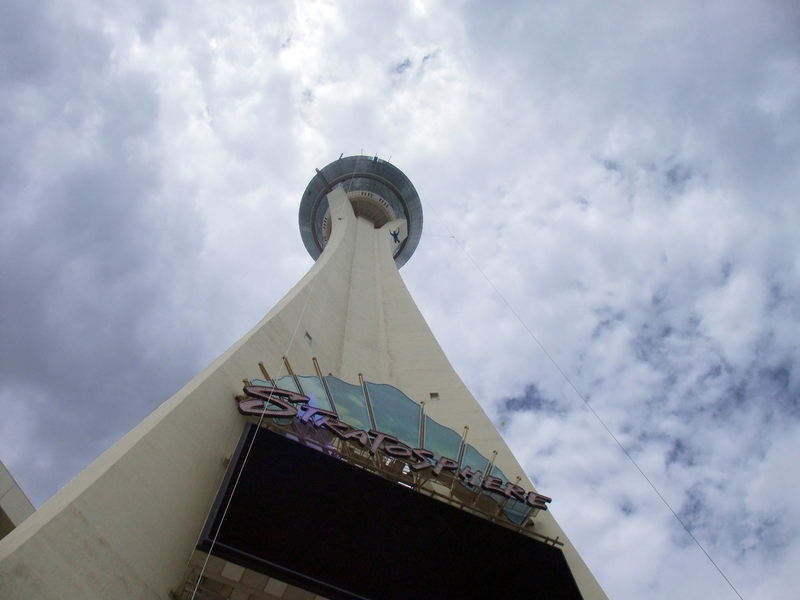 The Stratosphere is one of the tallest buildings in the country, and the SkyJump is nearly at the top of it, at a whopping 855 feet in the air. 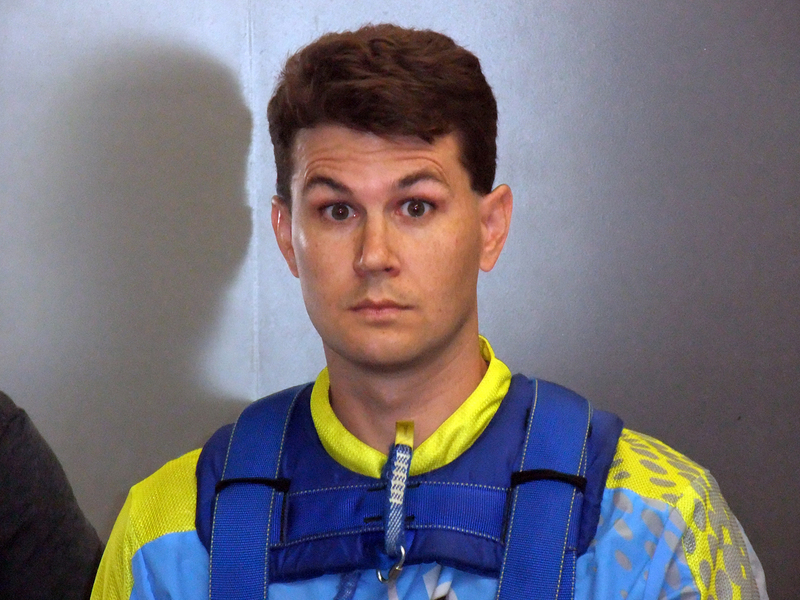 The premise is simple, really–get a small taste of skydiving without getting into a plane. 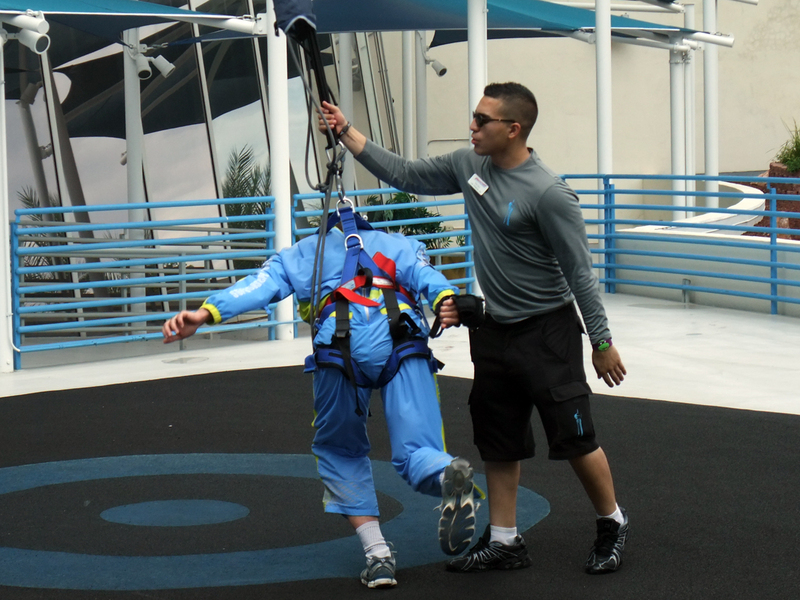 It’s not quite skydiving, nor bungee jumping, but it’s a safer version of both. In the store at ground level, you suit up in a jumpsuit, giving your friends an opportunity for pictures and jokes at your expense. Then you put on a safety harness and make small talk with the workers. Next you take a high-speed elevator to the top, wait your turn while watching other jumpers plummet out of sight, and then you’re up. You enter a room not unlike an airlock, where there are two crew members, a large winch and cable, and that’s about it. A crew member attaches the cable to the harness you’re wearing and checks for any loose articles of clothing/jewelry. Then they switch and the other one does it again, to double check. They didn’t actually say what they were doing, but I assume they were double checking when both people had me do the exact same thing. If they were double checking, I applaud their safety protocol, although it would have been nice if they explained it at the time. Once you’re hooked in, they open the door to the outside. 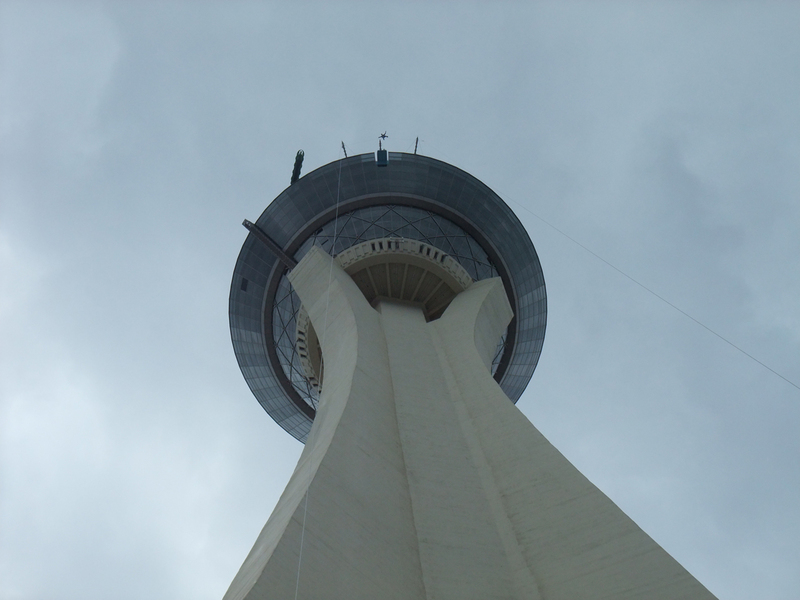 Remember, this is 855 feet in the air. You step out onto a small platform. They attach you to an exterior cable and then detach you from the interior cable. Another backup safety measure, and this one makes a lot of sense. Then they tell you to stand at the edge of the platform. You’re outside the building now, with nothing around or below you. 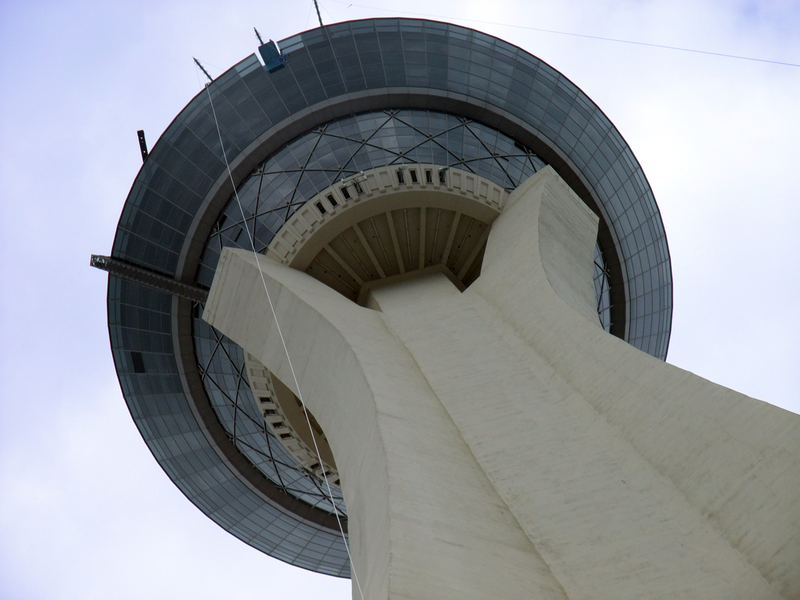 You can see cars waaaay down below, and have a great view of the famous Las Vegas skyline. You barely have time to soak it all in, when they count down for you. “3, 2, 1, jump!” And you do. Their command really does sound like a command. No banter up here. I’m not sure if they would actually push you if you don’t jump, but they sure sounded like it. So while I would have chosen to linger a bit more, I jumped when they said to. Heart-stopping. The moment you jump from that height is amazing. The sense of freedom and danger make for a potent cocktail of adrenaline. Most of this takes place during your horizontal motion, as you jump out. Almost as soon as you begin to fall, the cable catches you. 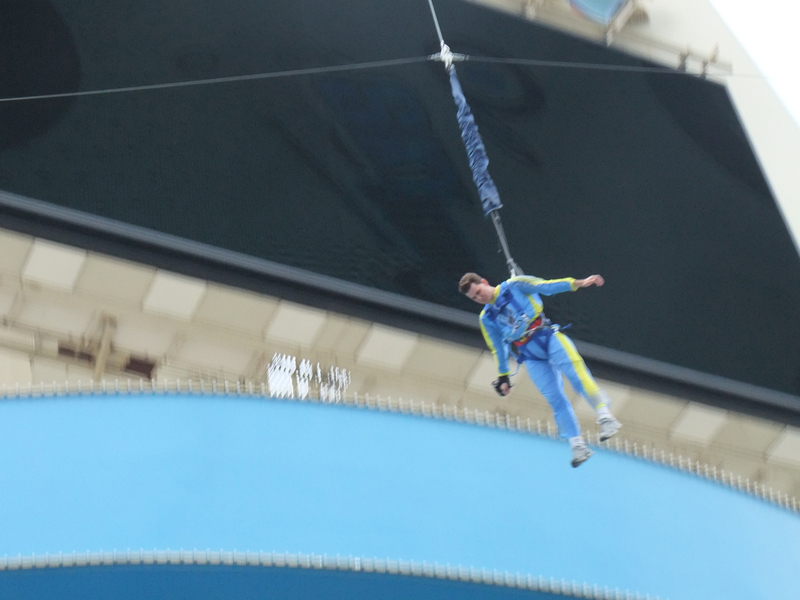 See, this isn’t a free-fall, or a bungee. It’s called a controlled descent. The cable has no slack for you to take with you. Instead, the cable lowers you at a pre-determined speed. 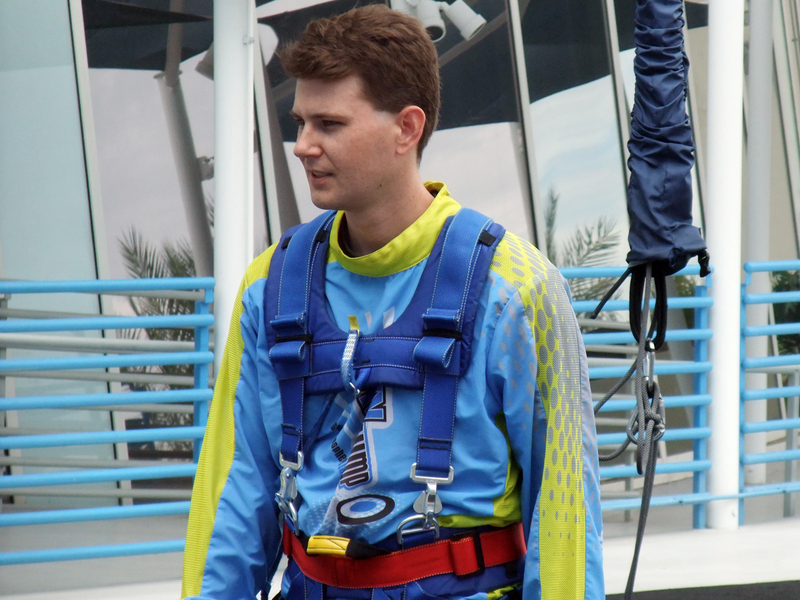 I was told it’s about 45 miles per hour, which is fast, but not free-fall-fast. 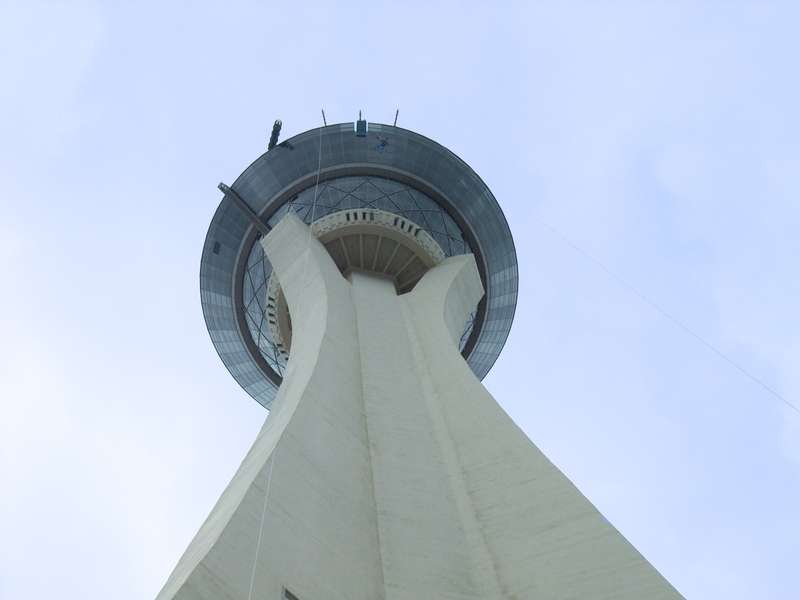 The tower is so high that even being lowered down gives you a long enough ride to enjoy the view and feel the air whip past you. Which reminds me of another good thing about the drop–no helmet. It really does add to the sensation to not have your head confined. Soon enough you’re at the bottom, hopefully landing on your feet at the rubber landing pad, where your friends await and everyone asks how it was. The answer is “great!” It’s thrilling, unique, and fun. A small complaint is simply that it’s not free-fall. I wish it was a bit faster, a bit more extreme. I think I understand the reasons that it’s not–bungee jumping is too hard to control the bounce, and skydiving is too close to the ground. I suppose if you fell a few hundred feet before the cable caught you it might be too jarring, and they didn’t want to risk whiplash. Maybe there’s another, more technical reason they couldn’t do that. I also wonder if that wouldn’t turn off some potential customers. Would someone who signs up to be lowered by a cable also sign up if the cable didn’t catch them for the first few hundred feet? Maybe not. Another small nitpick is that the safety crew is so focused on getting people in and out that they don’t really talk to you. As I mentioned before, I would have liked to know about their process, or hear about the equipment. Focusing on safety is rightfully their priority, but I don’t know why they couldn’t do both. Overall, I shouldn’t complain about what it isn’t, when when what it IS is still tons of fun. So much fun that I envy the people that work there, since they get to do it whenever they have a break in the customers. I know I would have no hesitation about going again. The attraction is open every day from 10:00 am until after midnight. Cost is $109.99, with upgraded packages including DVDs or merchandise. 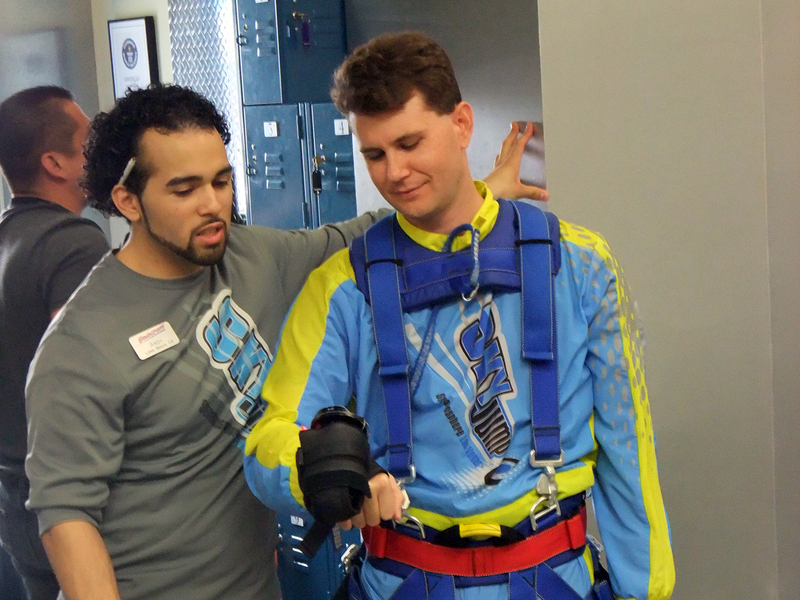 More information is at SkyJump Las Vegas. I had a hairline break in my tibia from this jump. A year my leg is still screwed up. Wow, I’m sorry to hear that. I didn’t feel it was a hard landing, but I suppose with an awkward angle, anything is possible.